As the state of Florida becomes more and more urbanized, the wild animals aren't just disappearing or moving to the wooded areas. Most animals are very adaptable, and are going to make do with whats available to them. That often means sharing space with humans by means of entering sheds, garages or even attics. Food and water are readily available, if you consider pet food bowls, garbage cans, bird feeders and swimming pools. When this co-habitation occurs, its often associated with noises, bad smells and desease laden filth. Too often, damage to your home or property will occur as well, as the interlopers make new entrances and exits to their newly adopted digs. Nuisance Wildlife Removal has built a reputation of honesty, reliability and highly effective nuisance wildlife removal. Our critter experts are well versed in current state statutes and maintain the proper credentials, permits and licensing to handle nuisance wildlife. Our integrated pest management & control is time tested, using specialized exclusion techniques and todays technology to resolve your wildlife conflicts.Our focus is on nuisance wildlife services, animal damage control & prevention and pest control so if you have a domestic dog, cat or a pet issue, please contact the local Humane Society. We are not a rescue or rehabilitation facility. Sick or injured pets and animals should be taken to a veterinarian or wildlife rehabilitator. We will remove problem wildlife from your home, garage, attic & crawl space. We will inspect, remove, relocate, clean out, exclude, repair and modify habitat as needed. When we leave, your home and property will be more suitable for human habitation, and less suitable for wildlife. Nuisance Wildlife Removal provides professional wildlife control for both residential & commercial customers in Orlando Florida. We offer custom animal control solutions for almost any type of wildlife problem, whether it be the noises of squirrels running through the attic, a colony of bats living in a building, or the destructive behavior of a raccoon or other critter, we have the experience and the tools to quickly and professionally solve your problem. For a consultation, give us a call at 941-729-2103. Not many Orlando pest control companies are licensed and insured professionals, specializing in nuisance animal removal. Make sure that you hire a competent expert for your Orlando exterminator of nuisance wildlife. At Nuisance Wildlife Removal, we will be courteous and friendly and take the time to answer your questions. Give our Orlando trappers at Nuisance Wildlife Removal a call, and we will listen to your problem, and make an appointment to perform an inspection. Florida is full of wildlife, including snakes, squirrels, raccoons, opossums, and more. You will need professional Orlando snake removal or raccoon control if you can't trap the wild animal on your own and perform full repairs and prevention to keep pests out for good. We perform the repairs and decontamination if necessary. Rats and mice love to live in attics, and can chew wires or leave droppings. In fact Orlando wildlife frequently enter homes, and it takes a pest management company to remove them. We are Orlando wildlife management experts, and are familiar with all the pest animals, including all species of Florida snakes and bats. We at Nuisance Wildlife Removal are the best among Orlando nuisance wildlife companies and can solve all animal damage issues. Our wildlife operators are skilled at bird control and bat removal, and would be happy to serve your Orlando bat control or pigeon and bird control needs with a professional solution. Opossums, skunks, moles, and other animals that can damage your lawn - we are the exterminators who can capture and remove them. 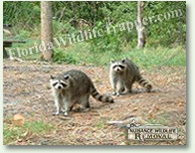 Our professional pest management of wildlife and animals can solve all of your Orlando animal control and capture needs. Give us a call at 941-729-2103 for a price quote and more information. on the mother where they will spend up to three months developing before emerging to fend for themselves. The opossum, or possum, was named by the Algonquians and it means "white beast." There are opossums found throughout the U.S.; the Virginia opossum is native to Florida. but this tail will not support a large adult. The tails are utilized more for carrying things than hanging from branches. the roads around Tampa Bay and Orlando have not died of natural causes. Opossums have a unique defense mechanism when threatened or harmed: they mimic the appearance of a sick or dead animal. This is an involuntary response they cannot control. and stews. "Possum" became somewhat of a "fad meat" in the sixties, made popular by the Beverly Hillbillies television series.